Lovenkrands: "it's not too much fun playing against Arsenal". | NUFC Blog. Lovenkrands: “it’s not too much fun playing against Arsenal”. 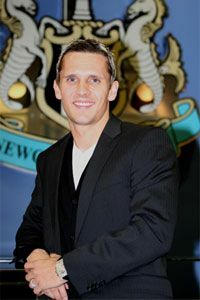 Lovenkrands: Hoping for a place. On the eve of Newcastle United’s League Cup clash with Arsenal, Newcastle United striker, Peter Lovenkrands, has been hailing the stylish passing play of the North London giants, likening them to Barcelona. However, the great Dane still thinks that victory is possible, especially after the Magpies’ scintillating 4-3 victory against the mighty Chelsea in the last round. Another one against the “Gooners” would mean a place in the Quarter Finals. Thanks to manager, Chris Hughton’s seeming preference for big target men such Andy Carroll and Shola Ameobi over swift gundogs such as Lovenkrands, it has been a lean time in terms of first team action for the Dane recently, however the League Cup has provided an opportunity for him to get some more time in, however it is still unknown whether he will feature for the Magpies tomorrow evening. He’s right about arsenal being good to watch. Though i prefer to watch them than barca. Less rolling about on the pitch. & barca are the pundits hat. PL should get some minutes tomorrow. Simpson, Barton, Nolan, Jonas, Willo, & Sodapop on the bench. Mabel making the tea at half time. More total shite punditry on sly sports. That should give us a chance but also keeps most first XI players fresh for the big game vs scum! I forgot all about Smith. He won’t be playing v smb’s either. Nowt serious, just a pull, i think. Give Tiote a rest and play smith?? i know what y’saying mate & normally i’d say yea, but i think he offers us more solidity at the back & in MF. So on this occasion i’d give him the game. It’s gonna be a tough enough game as arsenal will put out a decent team. Don’t risk any first team players, simply not worth it. it’s not like the gooners are dirty like. Aye but I still wouldn’t start first team players, keep them fit for Sunday. i just dunno if we should put all our eggs in one basket. It ramps up the pressure too much. Feel free to blame away man. He was a pile of poo against Wigan and thats being kind. defo no starters. We simply can’t risk them. Not that the Gunners would do a hatchet job, but shite happens and that’s the last thing we need ATM. Don’t give up the day job, toonsy! we do have options these days, it’s quite exciting. If man u had gone out earlier i would have been tempted to twist on this game. But then our 2nd string is strong. Only real borderline 1st team regular decisions for hughton are shola, krul, colo. I would be tempted to play shola to give us a genuine target up front. Mcloven, ranger could lack presence. Ranger on the wing looks good. i even get excited about the team sheet these days, nearly always decent logic to it. MAN I love Hughton. One smart bloke managing our club these days. Saylor’s not fit enough yet. it’s my best guess mate. Couldn’t think of owt else to write when i talking to meself last night mate. Close match to call this one-Hopefully Arsenal play shite and we give em a good going over..fingers crossed. Off topic – does anybody else agree that Budalovesapatsy ‘s avatar is absolutely lush. i look at it and i’m like Homer Simpson drooling over a bag of donuts…. mmmmmmmm donuts……. cmon lads, make us proud this week!